Laverne Cox, whose groundbreaking role on “Orange is The New Black” made her the first transgender woman of color on mainstream TV and a two-time Emmy nominee, visited Boston Wednesday to urge voters to keep transgender individuals’ rights intact by voting yes on Question 3. Cox hugged Chase Strangio, staff attorney at ACLU LGBT & HIV Project, on Wednesday. While Cox cheered on her fellow transgender activists rallying for the campaign, she spoke about tougher times in her own life 17 years ago, when she was weathering so much scorn and discrimination, she contemplated suicide. “Every day I left the house, I had to arm myself — not literally, but emotionally — because I knew when I left the house that I was probably going to be harassed,” she said. Cox could not explain exactly what changed her mind, besides inspiration in her burgeoning acting career. Question 3 is a voter initiated ballot campaign aimed at revoking the law, which added gender identity to the list of prohibited grounds for discrimination in places of public accommodation, resort or amusement. A “yes” vote would preserve the law. A “no” vote would repeal it. Cox and other speakers pointed to a recent New York Times story saying the Trump administration is considering rewriting federal policies to, essentially, codify gender and define transgender people out of existence. “Massachusetts has an opportunity to send a message to this administration, has an opportunity to send a message to the rest of the country that this is not who we are as Americans, that this is not who we are as human beings, that we respect the humanity of everyone,” Cox said. Another speaker, Alexandra Chandler, thanked fellow advocates for the “army of love of reinforcements that have come to support us,” and called for reframing the debate in a positive way: This is an opportunity for Massachusetts to show its leadership on social justice. Chandler, one of 10 Democrats who ran in the primary for the Third Congressional District, was the state’s first openly transgender candidate for Congress. Speakers also included transgender youth, including Lia, an elementary school student who said she feared for her rights outside of school if Question 3 is voted down, and Ashton Mota, a 14-year-old freshman from Lowell. 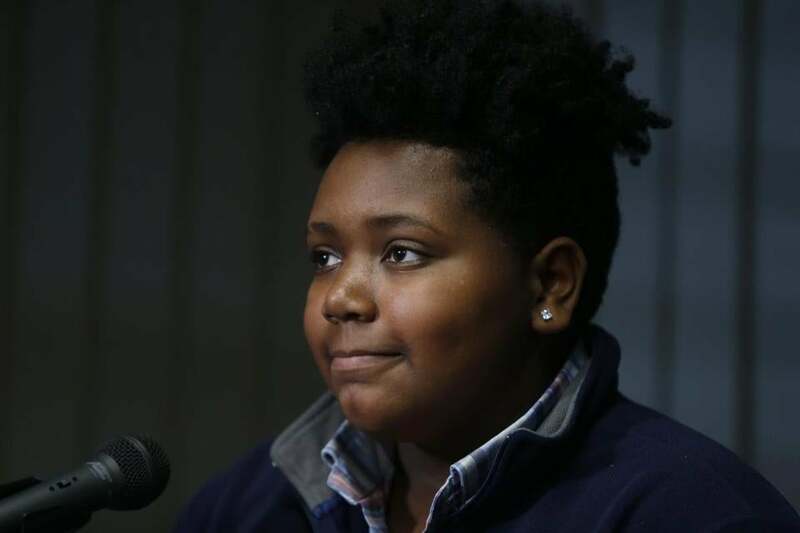 “Transgender youth throughout Massachusetts need to know that they matter, that we are worthy of protection, affirmation, and celebration,” Ashton Mota said Wednesday. “Transgender youth throughout Massachusetts need to know that they matter, that we are worthy of protection, affirmation, and celebration,” Mota said.